doctoral student who is working as an intern for Elio's father for a 6 week period, over the summer. Amid the summer heat in Italy, Elio and Oliver discover their desire for each other and a powerful romance blooms between them; soon they realise the summer of 1983 will alter their lives forever. The coming of age movie is really unlike any other film I've ever seen. It tells a romantic story of two men falling in love - something that is portrayed as really natural and real. 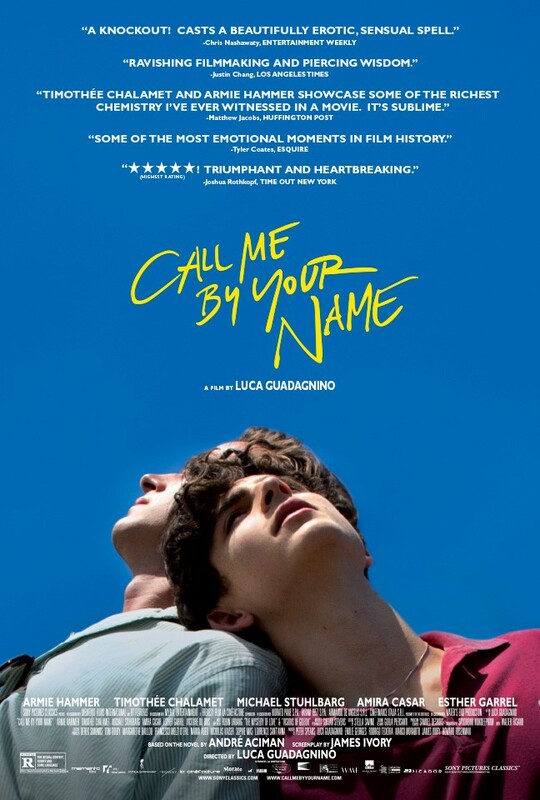 Call me by your name really relays the message that regardless of gender, love is love; it is a story that the world really needs right now, a story that will always be relevant. 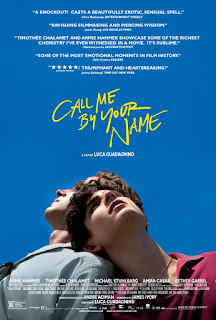 Peter Spears, the producer of the film, has commented before that Call Me By Your Name was the film that he needed when he was younger. It is a film that is a pure celebration of love, compassion and life. A film in which two men can find the stars together and share a life-changing love, which is based on a mutual desire and understanding. It is a film which LGBT audiences can see that they too deserve a life full of love and acceptance. Personally, I found the movie hauntingly beautiful. I was really blown away and moved by this story. It made me quite speechless and heartbroken, the only way I feel after I've really fallen in love with a story. I think this is why it is so relatable for everyone and anyone though, it tells a non-generic love story, yet it is a love story nevertheless. It's a coming of age story, or a story about bisexuality - however you interpret it, or whatever you take from it, it remains the same, that seeing these characters fall in love awakens something in everyone a feeling or a memory - everyone has fallen in love and everyone has had their heartbroken in one way or another. Chalamet and Hammer really portrayed these characters in a outstanding way - they were so incredibly perfect for the roles it's quite difficult to explain. One way to put it is that you can't even see an element of the actors in their roles - obviously how it's always meant to be - but they do truly disappear into their roles so only the characters remain. 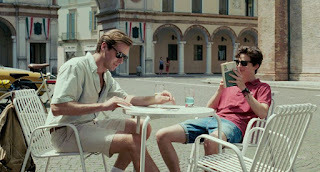 One of the final scenes in the movie, when Mr. Pearlman speaks his monologue to Elio, is one of the most moving. The speech itself is about not trying to hide or contain your feelings, about feeling pain and allowing ourselves the time to feel the pain we do - not trying to cure ourselves before we've really had time to feel and heal. It's also about Mr. Pearlman accepting and being ok with whoever Elio wants to be. Normally these films have so much hatred and non-acceptance, one or more characters who are homophobic, so it's really up and coming and refreshing to actually have a movie where the characters are being accepted for who they are. The soundtrack for the movie is one of the most exquisite of 2017. The songs fit in perfectly with the scenes themselves and with the setting of the film. Not only this, but Luca Guadagnino created a crafted masterpiece. The film was shot in sequence - something that is rarely done - and I think it really shows in the film. The shots are artistic, they aren't rushed and it doesn't feel like the scenes have been squished together in order to fit as much as possible into the the 2 hour run time. Instead the pace set by the director feels true to the story, it allows the viewers to see Elio and Oliver feign their feelings and gradually fall in love, without jumping straight into that element of the story. To finish with a quote as always, I'll leave you with one from Mr. Pearlman's monologue. "We rip out so much of ourselves to be cured of things faster than we should that we go bankrupt by the age of thirty and have less to offer each time we start with someone new. But to feel nothing so as not to feel anything - what a waste"
Call Me By Your Name is currently being shown at select cinemas. It is available on DVD in the UK on 5th March 2018. I found this Unicorn Cupcake recipe back in March and I've had my eye on it since then. The outcome of the cupcakes looked really cool and quirky and they were definitely something I wanted to try. I would say you need at least two people to make these cakes - I did it by myself and I end up with cake mixture and colouring absolutely everywhere, so at least two people would probably make it a lot easier. 2) In a bowl, add the flour, baking powder, caster sugar and salt. Use an electric whisk and whisk the mixture together for a few minutes of until all the ingredients are combined. Alternatively - if you don't have an electric whisk, try sifting the ingredients together to ensure their are no lumps. 3) Add the unsalted butter, softened butter and mix the ingredients again until it resembles a very fine, sand like, texture. 4) After this, measure out the milk, yoghurt, oil and vanilla extract into a separate jug or bowl and whisk well until the ingredients are fully combined. 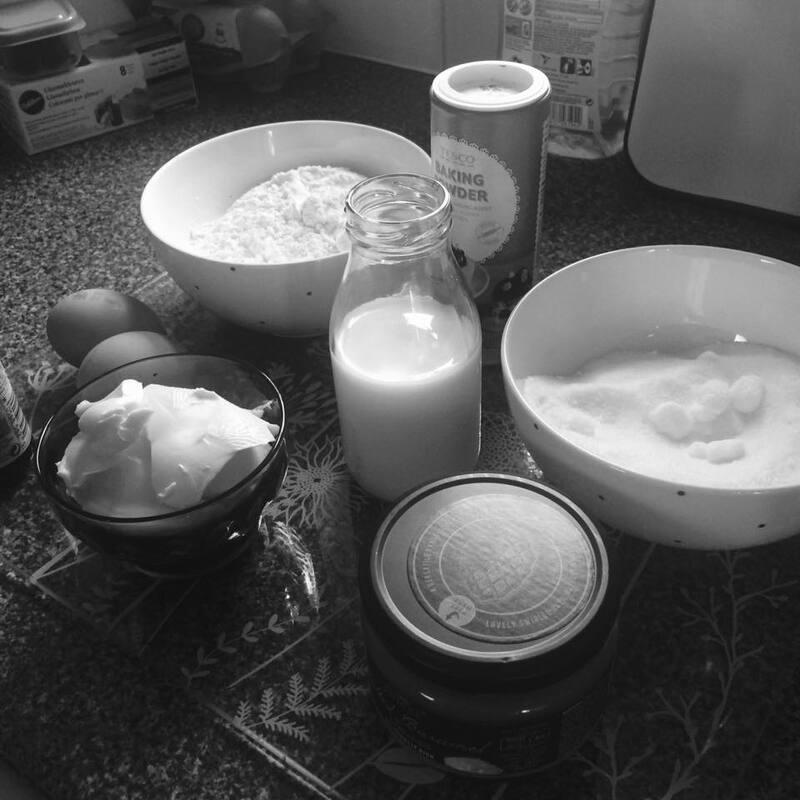 5) Next, slowly add the wet ingredients to the dry ingredients in a steady fashion, whilst whisking the mixture, until you've completely combined the two mixtures. 6) Split the batter equally between the three bowls. Then, colour one with 2 drops of blue gel, one with 2 drops of pink gel and the last one with 2 drops of pink and 2 drops of purple (or use as much gel as it takes to colour your mixtures). 7) Transfer the batter in 3 separate piping bags and carefully pipe little blobs of each colour in the cupcake liners. Make sure you alternate which colours you use in order to create un-ordered but colourful cupcakes. For example, pipe a blob of pink, then blue, then purple and repeat until you've filled the cupcake liner 3/4 of the way. 8) Bake the cupcakes for 20 to 25 minutes or until a toothpick or knife inserted into the centre of a cake, comes out clean. Transfer the cakes to a wire rack and allow them to cool. 1) To prepare your icing whisk your unsalted butter until it is fluffy and completely softened. 2) Next, add your icing sugar and whisk the mixture until the butter and icing sugar are completely combined and you have a fluffy mixture. 3) Add the vanilla extract and milk/water, to softened down the mixture - you can always add more if need be, but ensure your icing retains 'peaks' (points). 4) To add colour to your icing, use the same method as your cupcake mixture. Separate the icing into three bowls then add 2 drops of blue to one bowl, 2 drops of pink to another and 2 drops of purple and 2 drops of pink to the last (or use as much gel as it takes to colour your mixtures). 5) Then transfer the mixture into ONE piping bag - trying to ensure the colours stay separated as much as possible. You can use a star shaped piping head and ice the cupcakes in a spiral movement - for a simpler but still effective look. I used the second icing technique - just because I felt the first would create more icing than their was cupcake. I hope you enjoy these cupcakes if you make them! They're quite a lot of work, but totally worth it. "Be the baddest unicorn in the whole freakin' galaxy"
Starting my first year of university in September was hugely daunting for me, and as I've said in a previous blog post, I struggled a lot with homesickness. 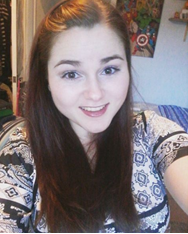 So coming towards the end of my first year, I thought I'd share my top tips for dealing with missing home; although I'm scared I'll still face homesickness in my second year, and I still can't see myself going weeks at a time without seeing my family - I'm trying to feel positive that even if it takes a trip home every weekend, I'll be able to do it; with the support of my family and friends (from home and uni). My first tip is to surround yourself with people. I was constantly (and still do) sitting in my flatmates rooms and having a chat with them; or if they were busy I'd go to uni instead and sit in the cafeteria or library until someone was around that I could hang out with or I had a lecture. As time progressed I also discovered keeping in contact with my family a lot and my friends from home made me feel a lot less lonely. Even if I was just texting a friend from home or one of my sisters. I also found face time really handy. I'm quite lucky that one of my sisters is home a lot so the first thing I do, even now, is call or face time her as soon as I wake up in the morning. It might sound excessive to some people but for me, it works. I'm use to being surrounded by people and noise at home so to go from that to silence (most of the time) it was a big adjustment - especially at first anyway. Thus, having a bit of company when I'm doing my make up or having my breakfast helped a lot more than you'd ever think it would. Some people say you need to cut yourself off from your family for a week or so, so you can adjust to not speaking or seeing them everyday, but honestly at that point, I couldn't think of anything worse than not speaking to my family for a week; knowing I was able to speak to them everyday helped me a lot more than cutting them off ever would've. My second tip is to go and explore this new place that you're lucky enough to now live in. I admit I didn't do enough of this when I moved away, mostly because I got it into my head that I absolutely hated where I'd decided to go to uni (and to be honest I still struggle with the place now). But I really feel this is a good idea. It can be scary exploring alone at first so drag along one of your course mates or flat mates and find some new things to do - some restaurants you could go out to eat one night, some cute cafes for lunch, a pretty park you could have a wander about in, the main social areas - bars, clubs, the cinema, bowling - the list goes on. Find a few things that perhaps you do at home with your family and could do with your roommates too - it could be something new for them to experience. We have a range of dessert shops that me and my friends love visiting when I'm at uni - we don't go there REALLY often but it's something we enjoy doing together. 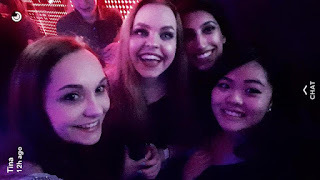 We go out for food or drinks quite a lot or in my first semester we had "take out Mondays" little group things like that, that seem small, really made a huge difference to helping me get through our first semester. My third tip is to give yourself time. If you're feeling homesick that's probably the last thing in the world you want to hear; I wanted to be ok straight away and just get on with my uni life rather than missing home and feeling sad and down. But realistically that's not going to happen. I constantly got told to give myself till Christmas which felt like, honest to God, years away, rather than a couple of months. So I know me saying "give yourself time" is probably making you feel worse than better but honestly, it's the best thing you could give yourself right now. Through all the things you're probably feeling right now, you need to allow yourself time to adjust to this new place and the new people around you. You need to get yourself into a new routine and try to stick to it. Once you start lectures it's a lot easier as you already have a set routine that you have to stick to regardless. Even if you want to give up immediately as I did, don't take the decision lightly. Speak to the support centre at your uni or students union, they'll have more information they can give you on your options. Also talk to your parents and siblings or even friends who are at uni or have just moved to uni; there's loads of people around that can give you advice and support you through the decision you have to make. Think about the future too; you don't want to look back and regret your decision and wish you'd stayed to give it more of a chance. But saying that, your priority is making sure you are happy. Honestly, at the start of the year I felt like I was going to make myself seriously ill by continuing my time away from home. But by talking to the student union and my parents we managed to find a solution and from then on something clicked in me and I began to enjoy my time more. Obviously University isn't for everyone, and if you feel like there's no light at the end of the tunnel then do consider your options to move back home or do something else. University isn't for everyone and even if your new flatmates are coping just fine that doesn't mean it's not ok to feel the way you're feeling. It's perfectly legible to feel homesick more people than you think are going through it or have been through it. I was very, very, lucky to only have to spend a few days at uni each week. My lectures were on 3 consistent days so I managed to spend the rest of my time at home as I only live an hours train ride away. I honestly don't think I would've managed to cope until (even) Christmas at uni if I didn't get to go home every few days. You know I was saying about that solution that made me start to enjoy uni more? Well that was it - spending 3 days away at uni and the rest of the time at home. I know most people aren't lucky enough to be able to do that. And some people may think it's caused more damage than good - I mean how will I adjust when I can't go home all the time next year - right? Well I'll just cross that bridge when I come to it. And I do still have my worries for next year, but I'm sure living with all the people I want to live with, will help greatly. My main advice is to just appreciate the time you do get to spend with your family and friends when you visit home - that's the best thing you can do. I hope some of these things help you if you are struggling with homesickness. I am always around to talk to, as someone who can understand how you're feeling and what you're going through. But remember your friends, family and uni are there to talk to as well. Everyone just wants to support and help you through your time at University, and try to make it enjoyable for you. Googling homesickness brings up so many results, and I hugely recommend reading up on how other people have dealt with home sickness, some ideas may work for you and some may not but it's definitely worth it, and if anything it helped me feel less alone whilst I was experiencing it. Me and my friend Meg from Project Castaway wanted to do a bit of a collaboration (of sorts anyway), so we came up with the idea to do question and answers with each other. 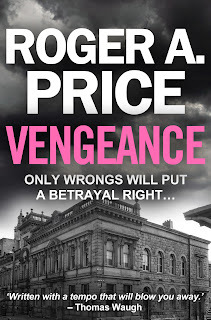 I previously did a Q and A with Vengeance writer Roger A. Price and I thought continuing the theme would be a cool idea and Meg wanted to start doing more Q and A's on her blog as well so it was a good way for her to introduce it! We both hope you'll learn a little bit more about us through these mini question and answer's! Q: So Meg, what is your blog about? A: I blog mainly about reviews on TV shows, films and musicals/plays. 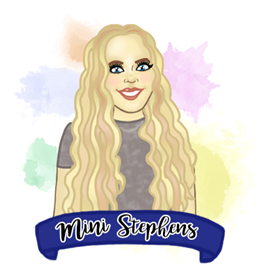 I blog my adventures that I have been on and now and again I blog about something I'm feeling at the time whether that'll be advice, food or a topic of interest. Q: Why do you enjoy blogging? A: I enjoy it because I find that it is a great way for me to express myself and to say my opinions. It also helps me to relax at the end of the day. Q: Why did you decided to call your blog Project Castaway? A: It's not a very interesting story but at first I saw some blog names that had project in it and as my blog is a project for me I wanted to use that in the name. Then I was looking around in my bed room and found my game called Sim Castaway and came up with Project Castaway. Not very inventive I know, but I like it. Q: What type of blog post do you enjoy writing the most? A: I mainly like writing reviews on things and my adventures the most. I think that's why I do them more than other posts. I find it really interesting to look back on what I have put. Q: What have you got lined up for the future of your blog? A: I'm wanting to start collaborating with people more. So I think that'll be the next step for my blog really. Q: Is there any genre of blog posts you'd like to try out? A: I would love to try out more food posts as I haven't done much and I want to see what I can do with it. Q: When did your start your blog? A: I start on the 3rd January 2015. So this is my 3rd year of blogging. Q: What do you find the most challenging about blogging? A: How to word things, sometimes it's tricky because you want to come across a certain way but you're not quite sure how to do that. Q: What's one thing you wished you'd known before you started blogging? A: How to advertise my blog properly. I'm still learning how to do that really. I think it's a great way of connecting with other bloggers and it's such a tricky thing that I don't think has been explained properly. Q: Have you been to any blogging events? If not would you like to go to one? A: I haven't, but I would love to go to one. I just can't seem to find any local ones. I hope you've enjoyed this blog post as much as me and Meg enjoyed creating them. If you want to read my answers to Meg's questions then click here! 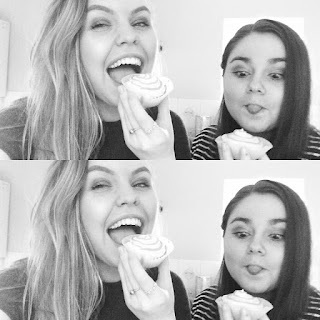 If you'd like to check out mine and Meg's joint YouTube channel click here. "Blogging is not rocket science, it's about being yourself and putting what you have into it"
I've made these Salted Caramel Cupcakes twice now; the basic cupcake recipe is super easy to follow, however filling and icing the cupcakes is a bit more complicated and time consuming (however SO worth the yummy cupcakes you end up with), so if you decide to make these cakes make sure you have enough time and perhaps a bit of help to help you prepare the icing and the salted caramel. The first time I made these cupcakes, me and Meg wanted to film a video and needed a recipe to do so, we found a salted caramel cupcake recipe online but we wanted to put our own twist on the cakes, so we decided to fill the cupcakes with salted caramel as well as creating our own icing to compliment them. If you'd like to check the video out, you can do so here. The second time I made these cupcakes I had a bit of help from my mum; I attempted to make them by myself, however, honestly, a little bit of help goes a long way, and having someone to cut out the centres of the cakes and ensure the icing and salted caramel is the right consistency for being piped means you have a little less to do. 1) Preheat the Oven to 175/180 degrees Celsius. Line a cupcake try with 12 paper liners (you can always add more if you have additional cupcake batter). 2) Using a mixing bowl, cream together the sugar and margarine until they're fully combined. 3) Beat the eggs together in a jug and add in the vanilla extract. Gradually whisk the eggs into the sugar and margarine mixture, adding a little at a time and beating well after each addition. 4) Using a separate bowl combine the flour and baking powder. Then carefully fold in the flour mixture alternating with the milk, in several additions. 6) Once cooked transfer the cupcakes to a wire rack to cool. 1) Once the cupcakes have cooled cut out the centre of the cakes. Make the hole circular and about half way down the cupcake (a small to medium size). 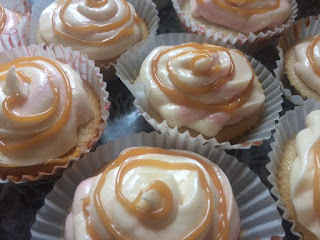 2) Once the centre of the cakes have been removed start piping the salted caramel into the centre of each of them. 3) Replace the centres of the cakes as you go. Cut off the bottom of the centres only leaving the top part remaining - do this so the salted caramel doesn't overflow out of the middle of the cake. 1) Weigh and combine the icing sugar and the unsalted butter together by whisking the mixture together. 2) Add in the vanilla extract and milk and stir them into the mixture. The icing should be light and fluffy and should drop off a spoon without any force, but not run off a spoon otherwise it is too runny. 3) If you want to add some colouring into your icing you can do so now. To only colour part of your icing remove a small section and place it into a separate bowl. Then add in a drop of your chosen colour. 3) Put the icing into your piping tube and pipe it in a circular motion onto the top of each cupcake. If you have coloured icing too try to place it directly next to your white icing in the actual piping tube. 4) Once you have iced all of your cupcakes return to your salted caramel piping tube and follow the lines of your icing to ensure your salted caramel follows the structure of your icing. "You can't be sad when you're holding a cupcake"
Today I'm doing a Question and Answer with author Roger A. 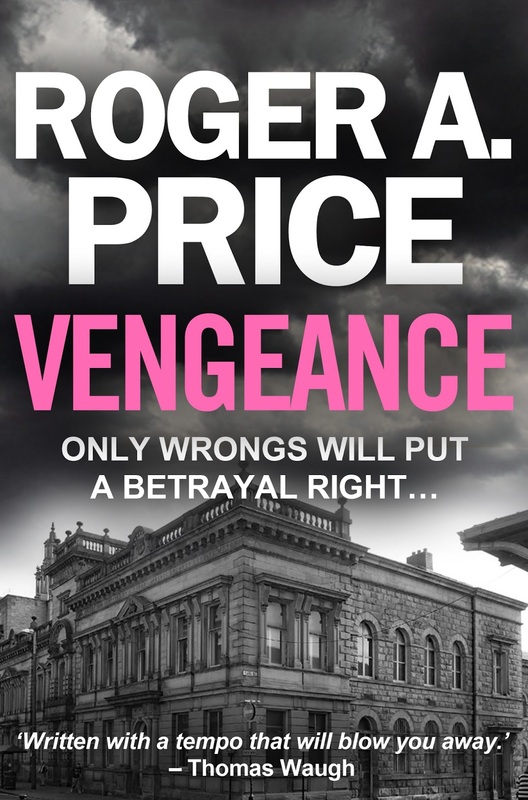 Price, a crime fighter turned crime writer. Price spent over thirty years in the police; retiring as a detective inspector in charge of a covert undercover drugs unit which achieved national acclaim. He served on various units and squads and saw service across the UK, Europe and beyond. Although Price cannot write about the events he encountered, he does base his crime fiction on his many experiences; some of which were good, some not so good. 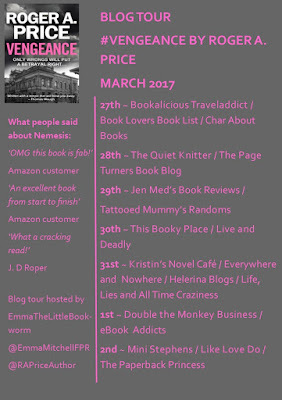 ‘VENGEANCE’ is the second novel in Price's 'Badge and the Pen' series which follows the fortunes of detective inspector Vinnie and his unlikely ally TV reporter Christine, where they both face the most unlikely of threats, as they race to save lives. 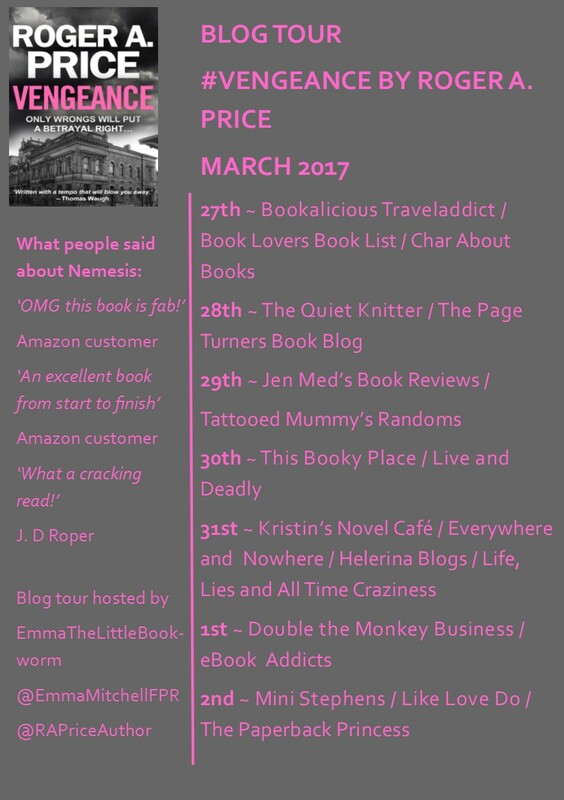 This blog post is slightly different to my usual blog posts as this is part of the blog tour for Price's new book Vengeance. So Roger, what is the first book you remember reading or having read to you? Not sure which one exactly, but my love of reading fiction came from reading Enid Blyton’s ‘Famous Five’ series as a child. I just loved the way her stories fuelled my young imagination and took me to different place. There have been so many, but I love Lee Child’s Jack Reacher, and I’m not sure why? Child doesn’t develop the character over his books, as such, but I just love him. Perhaps the lack of authorial intervention simply allows the reader to fill in the blanks. It certainly works for me. I also love Stephen Leather’s Dan ‘Spider’ Shepard. Any of Earnest Hemingway’s. No excuses, I must go and buy one today. I love some of his quotes; like ‘Always write drunk, but edit sober’. It would have to be a long one, perhaps it would be time to give War and Peace a try? Just about to start Takedown by Stephen Leather. (Or should that be one of Hemingway’s? – I’ll do one next). Marty Felman, Doctor Who, Spike Milligan and Vinnie Palmer and Christine Jones, of course! Oh and Laurel and Hardy too. Anyone who encourages others, who is positive and constructive. I can’t stand people who take pleasure in bringing others down. I quite enjoy it when I can get out on my motorbike on a sunny day. Clint Eastwood – but a younger version, of course. My last one; it’s always the last one. Be very, very childish and have lots of fun. Being very, very childish and having lots of fun. It’s great to be able to connect direct with people who have read your work. When someone takes the trouble to tell you how much they have enjoyed something which you have created, it really, really inspires. Photos of peoples’ lunches, or pints of beer??? Roger A. Price is also doing a Vengeance giveaway. If you'd like to enter please click here. I first saw The Woman In Black stage play back when I was doing my GCSES, as part of our Drama coursework we had to do a theatre review, and that year coming to our local theatre was The Woman In Black. I remember vividly where me and my friends sat, that we attended 'schools night' (where various schools attend one evening show all at once), and also that we were completely terrified by the end of the show. I think everyone fed off each other and as the audience was full of 14 to 16 year olds, we all felt tense and as young people do - their emotions become intensified. So as the woman in black first appears and all the girls are screaming down in the stalls, we're all looking over the balcony and gripping each others hands tightly to see whats going on. The main thing I remember though - was that although we were scared out of our wits and that it was an absolutely incredible show, so when Meg mentioned wanting to see it, and we found out it was not only coming to the Everyman Theatre again but that we could also get £5 tickets, we jumped at the chance to buy them. The Woman in Black was written in 1983 by Susan Hill and follows the story of Arthur Kipps. Stephen Mallatratt, a playwright, adapted the story into a play back in 1987, before it first appeared on stage in late 1987 before appearing in the West End in 1989; making it the second longest non-musical play within the west end. The story of Arthur Kipps is portrayed completely differently to that of the 2012 film which stares Daniel Radcliffe. On stage, the play only features 2 main characters (excluding that of the actual Woman in Black), The Actor and Arthur Kipps. The Actor - portrayed by Matthew Spencer - is helping an elderly Arthur Kipps (David Acton) to tell the story of his encounter with the woman in black to his family and friends by performing his story on stage. It is obvious at the beginning of the story that Kipps has never performed before, and so he recruits the Actor to help him perform his story. Within their onstage play, The Actor plays a young Arthur Kipps, whilst the 'actual' Arthur Kipps plays various other characters that appear within his story - these include Keckwick - the driver of the Horse and Trap, Mr Bentley - Arthur Kipps employer who sends him to Eel Marsh house and Samuel Daily - who befriends Kipps on his train to Crythin Gifford and who Kipps seeks advice from about Eel Marsh house - as well as the narrator of the story and various other characters Kipps meets along his journey. At the beginning of the play, they regularly switch from reality into rehearsing 'the play', showing the alternate stories via white and blue lighting. However, towards the second half of the story, The Actor encourages them to rehearse the play continuously without stopping. Although I did enjoy the first part of the story, the switching back and forth between reality and the play, did get slightly irritating. It was understandable as to why they used this technique as it ensured that the audience remembered that they were performing a play within a play, but also to make it slightly more realistic - for example, the day would come to an end, so they'd stop rehearsing the play and come back the next day to continue. However, I found the second half of the play much more enjoyable as it was more continuous for the story and allowed me to get more invested in the story being told. After the pairing began telling the story, we follow a young Arthur Kipps (aka The Actor) from London, where he receives his assignment, on his journey to Crythin Gifford, and on the horse and trap to Eel Marsh house. This is where Arthur begins seeing the woman in black and hearing creepy noises around the house - the rocking chair with no one in it, the doors slamming and deafening screams. Once this begins he starts unveiling the story of Alice Drablow - the owner of Eel Marsh house up until her recent death, Jennet Humfrye her sister who is the infamous Woman in Black and Jennets son Nathaniel who is adopted by Alice and her husband before his devastating death when he was only 7 years old; and is the sole reason for Jennet becoming the Woman in Black in the first place. The play entails you to use your imagine quite a lot, the set stays the same throughout the whole play, with the chairs and baskets being used as different props within different scenes. The horse and trap is created by the two baskets, with the actors bobbing up and down and diegetic sound effects of horse hooves. The chairs are used to show Arthur Kipps switching trains for his journey to Crythin Gifford; and the dog that Samuel Daily lends Arthur to keep him company at the house is created by imaginary stroking and patting, along with the actors crouching down to pet the dog and talk to it. I think that all the ways they create these objects is really clever, they do it in such as way that it isn't hard for us to picture the actual objects and fill in the spaces with our imagination; the actors do all the work with their movements and it makes it easy and enjoyable for us to know what they are doing and when. These elements also added humour into the play - although its a tense horror story and for the most part we were sat with our scarves rolled up and covering our faces, the little bit of humour they injected into the play really made a difference. I can't describe how The Actor crouching down and petting an imaginary dog and making a baby face at it is an hilarious combination - but it is. The interaction between The Actor and the real Arthur Kipps whilst they're in the reality element of the play was also hilarious - their personalities just mixing together; David Acton and Matthew Spencer just effortlessly played off each other. Another element that created a lot of laughter from the audience were the very tense moments - where the darkened stage and dragged out silence made everyone believe they were going to get a frightening jump from the Woman in Black and instead a door slammed or there was a loud scream, yet everyone jumped out of their seats anyway - created a huge amount of laughter within the audience, so much so that parts of what were being said on stage were missed. I would 100% recommend going to see The Woman in Black if you ever gain the opportunity to. It is a wonderfully terrifying show that provides both tension and humour throughout. I'm somebody who has never been a fan of horror films - there is something about this story that I absolutely love. I do remember being a lot more scared when I saw the play the first time but I think that was just because I was much younger. No matter who you are you're guaranteed to jump out of your seat at least once. The lighthearted elements of the play are a nice release to the very tense moments, and the little twists that are injected into the play make it a lot more interesting too - meaning if you have seen the film before it won't even matter as the play is completely different. Although I've already seen the play once, I think if I do ever get the chance to go again, I'd definitely take it. You never entirely remember a play completely and every director is bound to change small elements anyway. The Woman in Black is currently touring around the UK and playing at the Fortune Theatre in London. To find out more information about the dates and show click here. "From the start it has been the Theatres business to entertain people...it needs no other business than fun"